Western blot analysis of extract from CML-T1 leukemic cells with Phospho-c-Abl (Tyr89) (61A6) Rabbit mAb (upper and middle) or c-Abl Antibody #2862 (lower). The phospho-specificity of this rabbit mAb was verified by treating the membrane with calf intestinal phosphatase (CIP) (middle and lower) before antibody probing. 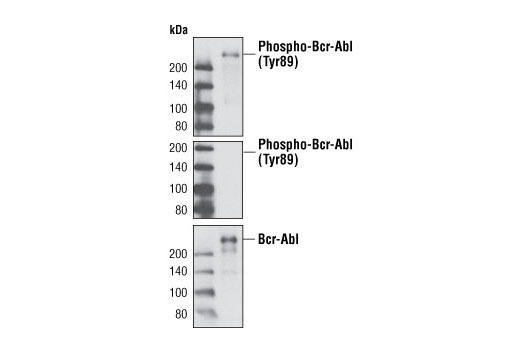 Phospho-c-Abl (Tyr89) (61A6) Rabbit mAb detects endogenous levels of c-Abl only when phosphorylated at Tyr89. This antibody may cross-react with other tyrosine-phosphorylated proteins. Monoclonal antibody is produced by immunizing animals with a synthetic phosphopeptide corresponding to residues surrounding Tyr89 of human c-Abl. Phosphorylation of c-Abl on Tyr89 was identified at Cell Signaling Technology (CST) using PhosphoScan®, CST's LC-MS/MS platform for phosphorylation site discovery as well as another publication using MS technology (7). For additional information please visit PhosphoSitePlus®, CST's modification site knowledgebase, at www.phosphosite.org.